Cyclic nucleotide phosphodiesterases (PDEs) are known as a super-family of enzymes which catalyze the metabolism of the intracellular cyclic nucleotides, cyclic-3',5'-adenosine monophosphate (cAMP), and cyclic-3',5'-guanosine monophosphate that are expressed in a variety of cell types that can exert various functions based on their cells distribution. The PDE4 family has been the focus of vast research efforts over recent years because this family is considered as a prime target for therapeutic intervention in a number of inflammatory diseases such as asthma, chronic obstructive pulmonary disease, and rheumatoid arthritis, and it should be used and researched by pharmacists. This is because the major isoform of PDE that regulates inflammatory cell activity is the cAMP-specific PDE, PDE4. This review discusses the relationship between PDE4 and its inhibitor drugs based on structures, cells distribution, and pharmacological properties of PDE4 which can be informative for all pharmacy specialists. Objective: Methicillin-resistant Staphylococcus aureus (MRSA) ranks top among the nosocomial pathogens. Nasal formulation of mupirocin is found to eradicate MRSA from colonized individuals, but the emergence of resistant strains is a matter of concern. Methods: Nasal swabs were collected from 200 health care workers (HCWs) who were screened for MRSA. 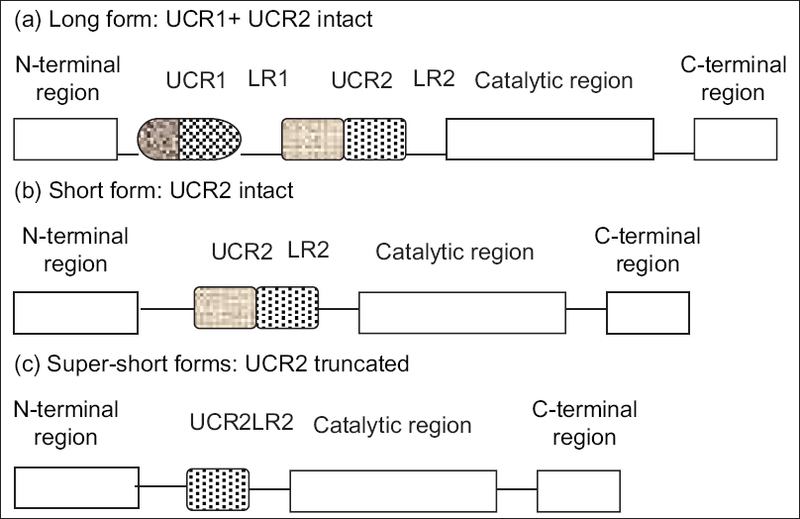 Kirby–Bauer disc diffusion method was used to perform antibiotic susceptibility test. MRSA detection was done using a cefoxitin 30 µg disc and interpreted according to the Clinical and Laboratory Standards Institute guidelines. Determination of mupirocin resistance was performed using Epsilometer test (E-test). Findings: About 14% of HCWs showed nasal carriage of MRSA. Nursing orderlies were the predominant carriers. E-test showed four mupirocin resistant isolates. The antibiogram of the MRSA isolates revealed the higher resistance to antibiotics as compared to methicillin-sensitive Staphylococcus aureus. All the MRSA isolates were sensitive to linezolid. Conclusion: HCWs in our hospital showed high nasal carriage rate of MRSA, particularly the nursing orderlies which is statistically significant. It is advisable to detect mupirocin resistance among the isolates obtained from the HCWs so that in case of resistance, alternative treatment should be sought. Objective: In some medical circumstances, pediatric patients may need premedication for transferring to the operating room. In these situations, using intravenous premedication is preferred. We assessed the efficacy and safety of intravenous midazolam, intravenous ketamine, and combination of both to reduce the anxiety and improve behavior in children undergoing general anesthesia. Methods: In a double-blind randomized clinical trial, 90 pediatric patients aged 6 months to 6 years with American Society of Anesthesiologist grade I or II were enrolled. Before anesthesia, children were randomly divided into three groups to receive intravenous midazolam 0.1 mg/kg, or intravenous ketamine 1 mg/kg, or combination of half doses of both. 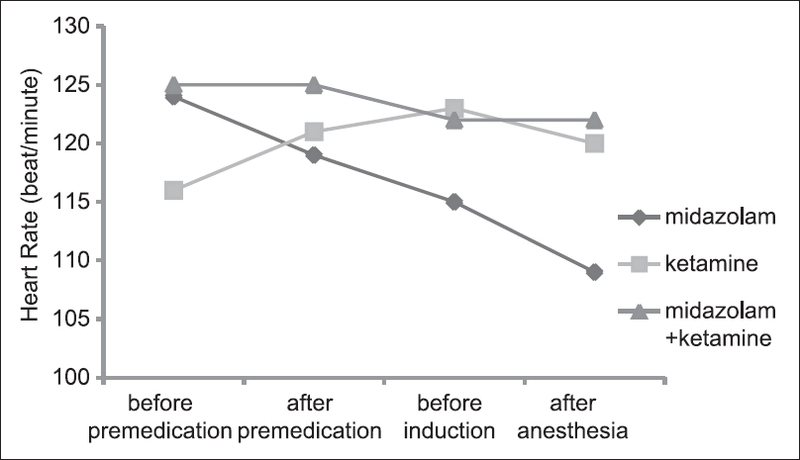 Behavior types and sedation scores were recorded before premedication, after premedication, before anesthesia, and after anesthesia in the postanesthesia care unit. Anesthesia time, recovery duration, blood pressure, and heart rate were also recorded. For comparing distribution of behavior types and sedation scores among three groups, we used Kruskal–Wallis test, and for comparing mean and standard deviation of blood pressure and heart rates, we used analysis of variance. Findings: After premedication, children's behavior was significantly better in the combination group (P < 0.001). After anesthesia, behavior type was same among three groups (P = 0.421). Sedation scores among three groups were also different after premedication and the combination group was significantly more sedated than the other two groups (P < 0.001). Conclusion: Combination of 0.05 mg/kg of intravenous midazolam and 0.5 mg/kg of intravenous ketamine as premedication produced more deep sedation and more desirable behavior in children compared with each midazolam 0.1 mg/kg or ketamine 1 mg/kg. Objective: There is few data regarding the correlation between serum Vitamin D level and unfavorable intensive care unit (ICU) outcome in postsurgical patients. In this study, correlation between serum 25(OH)D level and length of ICU stay and in-hospital mortality has been evaluated in critically ill surgical patients. Methods: Serum 25(OH)D has been evaluated in 70 surgical, critically ill patients. Demographic, laboratory, and clinical data of the patients were collected. Correlation between serum 25(OH) D level and duration of ICU stay and hospital mortality was evaluated using two-factor analysis of covariance. Multivariable Cox-regression analysis was used for adjusting the effect of season of blood sampling and type of surgery on the main variables. For all the analyses, P values less than or equal to 0.05 were considered as statistically significant. Findings: Serum 25(OH)D deficiency was identified in 52 (74.3%) of the patients. Patients with serum Vitamin D levels < 30 ng/ml had longer length of ICU stay than those with serum Vitamin D levels ≥ 30 ng/ml (7.8 ± 5.1 vs. 4.05 ± 2.12 days, P = 0.003). Although hospital mortality was more common in Vitamin D deficient patients than sufficient ones (25% in deficient group versus 22.2% in sufficient group), there was no significant difference regarding hospital mortality rate between the groups. Conclusion: Statistically significant association was found between low 25(OH)D level and increased length of ICU stay in critically ill surgical patients. It could be explained by favorable effects of Vitamin D on immune system functions, reducing tissue dysfunction, and risk of organ failure and overall complications. However, there was no correlation between serum Vitamin D level and patients' in-hospital mortality. Further, well-designed prospective clinical studies with adequate sample size are needed to evaluate correlation between serum Vitamin D level and mortality in critically ill patients. Objective: In the past decades economic sanctions have been used by different countries or international organizations in order to deprive target countries of some transactions. While the sanctions do not target health care systems or public health structures, they may, in fact, affect the availability of health care in target countries. In this study, we used media analysis to assess the impacts of recent sanctions imposed by the Central Bank of Iran in 2012 on access to medicines in Iran. Methods: We searched different sources of written news media including a database of nonspecialized weeklies and magazines, online news sources, web pages of daily newspapers and healthcare oriented weeklies from 2011 to 2013. We searched the sources using the general term "medicine" to reduce the chances of missing relevant items. The identified news media were read, and categorized under three groups of items announcing "shortage of medicines," "medicines related issues" and "no shortage." We conducted trend analyzes to see whether the news media related to access to medicines were affected by the economic sanctions. Findings: A total number of 371 relevant news media were collected. The number of news media related to medicines substantially increased in the study period: 30 (8%), 161 (43%) and 180 (49%) were published in 2011, 2012 and 2013, respectively. While 145 (39%) of media items referred to the shortage of medicines, 97 (26%) reported no shortage or alleviating of concerns. Conclusion: Media analysis suggests a clear increase in the number of news media reporting a shortage in Iran after the sanctions. 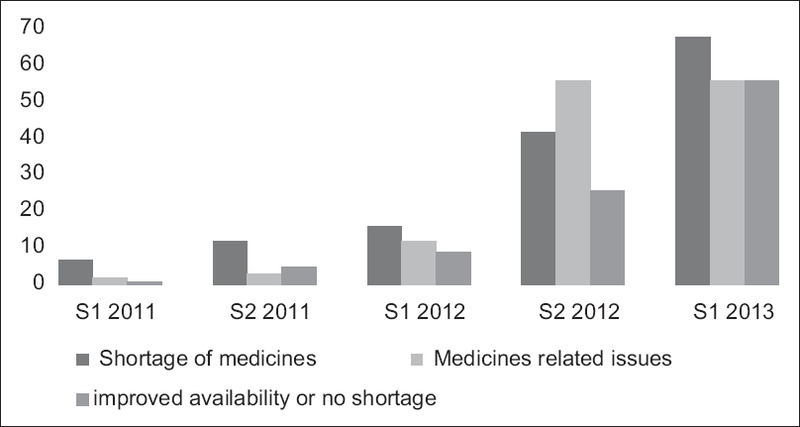 In 2013, there were accompanying increases in the number of news media reporting alleviation of the shortages of medicines. Our analysis provides evidence of negative effects of the sanctions on access to medicines in Iran. Objective: Acute myocardial infarction (AMI) is one of the main leading causes of mortality and morbidity. Reteplase is a fibrin-specific thrombolytic which is used in the treatment of AMI. There is a limited number of studies reporting the postmarketing adverse drug reactions (ADRs) induced by reteplase. This study was aimed to examine the reteplase pattern of ADR and its associated risk factors in patients with acute ST-elevation myocardial infarction. Methods: A cross-sectional, prospective study in an 8-month period was done at the University affiliated referral cardiovascular center. The Naranjo probability scale and World Health Organization criteria for severity of ADRs were used for assessing the ADRs. The linear regression and logistic regression tests were used to evaluate the correlation between ADRs and risk factors. Findings: The all 20 patients who received reteplase during the study period were entered. The majority of patients (n = 17) experienced at least one ADR. The results showed that the incidence of ADRs was mainly associated with gender and age, and the number of ADRs was associated with the history of diabetes and taking anti-diabetic agents. The gender was the main predictor in the occurrence of ADRs (odds ratio: 32, 95% confidence interval: 1.38–737.45; P = 0.030). Conclusion: The results showed that gender, age, diabetes mellitus, and using of anti-diabetes medications are the risk factors associated with the incidence of ADRs by reteplase. Objective: Adverse drug reactions (ADRs) are known as a cause of hospital admission. We have carried out a prospective study to characterize and assess the frequency, probability, preventability, and severity of ADRs, which lead to hospital admission in children. Methods: In a prospective observational study, a cohort of children admitted to a tertiary pediatric hospital was randomly screened to assess ADR as the cause of admission from June 2014 to January 2015. ADRs causing admissions were detected based on patients' records, interviewing their parents, and confirmation by medical team. The probability of the ADRs was assessed based on WHO criteria and Naranjo tool. The preventability assessment was performed using Schumock and Thornton questionnaire. Findings: Of the 658 evaluated emergency admissions, 27 were caused by an ADR giving an incidence of 4.1%. Among ADRs, 37.1% were estimated to be preventable. Antibiotics were the most common medication class which caused hospital admission. Conclusion: Pediatric pharmacotherapy still needs evidence-based strategies to improve child care including education, monitoring, planning for medications after ADR occurrence, and implementing preventive measures when applicable. Objective: This study was aimed to determine the prevalence of drug-related problems (DRPs), identify the most common drugs, and drug classes involved in DRPs as well as associated factors with the occurrence of DRPs. Methods: A prospective cross-sectional study was conducted on 225 patients admitted to medical wards of Tikur Anbessa Specialized Hospital, Addis Ababa from March to June 2014. Data regarding patient characteristics, medications, diagnosis, length of hospitalization, investigation, and laboratory results were collected using data abstraction forms through review of patients' medical card and medication charts. Identified DRPs were recorded and classified using DRP registration forms. The possible intervention measures for the identified DRPs were proposed and communicated to either the physician or the patient. Data were entered into Epi Info 7 and analyzed using SPSS version 21 (IBM Corp. Released 2012, Armonk, NY: IBM Corp). Findings: DRPs were found in 52% of study subjects. 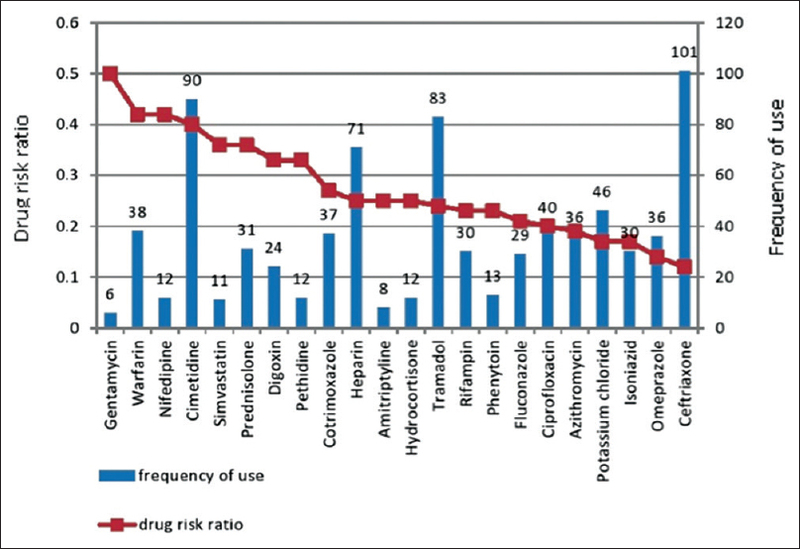 A drug-drug interaction (48% of all DRPs) was the most common DRP followed by adverse drug reaction (23%). Anti-infectives and gastrointestinal medicines were commonly involved in DRPs. Drugs with the highest drug risk ratio were gentamycin, warfarin, nifedipine, and cimetidine. The number of drugs taken by the patient per day is an important risk factor for DRPs. Conclusion: DRPs are common among medical ward patients. 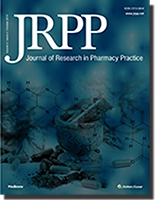 Polypharmacy has a significant association with the occurrence of DRP. Drugs such as gentamycin, warfarin, nifedipine, and cimetidine have the highest probability of causing DRP. So, patients who are taking either of these drugs or polypharmacy should be closely assessed for identification and timely correction of DRPs. Objective: The inappropriate use of antibiotics remains the primary factor in antimicrobial drug resistance. In this study, we evaluate the use of meropenem in surgical/medical wards of Imam Khomeini Tertiary Referral Hospital, Sari, Iran. Methods: This retrospective observational study was used to assess rational use of meropenem. The study was conducted by reviewing medical records of 100 admitted patients who received meropenem during March 2013 to January 2014. Findings: Meropenem was prescribed most frequently in Intensive Care Unit (22%), and pneumonia was the most common diagnosis (35%). The third-generation cephalosporins were the most frequently prescribed antimicrobials after meropenem (53%). In 21% of the patients, imipenem was changed to meropenem. Most of the inappropriate uses were seen in terms of frequency of meropenem use (34%), followed by duration of meropenem therapy (28%). Conclusion: Comparing our study results has shown higher inappropriate use. It is necessary to take action to improve prescribing habit in order to reduce the unnecessary usage of antibiotic thus enhance rational antibiotic use.